"My furnace has a big yellow sticker referencing it's AFUE.. What is AFUE again?" Annual Fuel Utilization Efficiency is an efficiency rating that is required by the Federal Trade Commission to be labeled on forced air furnaces and essentially indicates a furnace's fuel efficiency. In the same way a vehicle has a fuel efficiency rating of Miles Per Gallon (MPG), a furnace has a fuel efficiency rating of Annual Fuel Utilization Efficiency (AFUE). Furnaces can use a variety of fuels in order to create heat, be it: Wood, Gas, Oil, or Electricity - Every furnace uses, or converts some type of fuel into heat, and then uses that heat to heat up your home's air. The AFUE of a furnace describes what percentage of the fuel used by a furnace actually makes it into the home as actual heat, and in short: For each dollar you spend on fuel used when operating your furnace to heat up your home, just how much of that dollar shows up inside the occupied space of your home as heat? Therefore, it's important to remember that an AFUE fuel efficiency rating is specifically focused on the heating capabilities of a furnace, and ignores all the other functions or other forms of energy consumption your furnace may have. Remember: Furnaces are used to blow the air throughout our home's duct work regardless of whether the thermostat is set to "Heat", "Cool", or "Fan Only" mode. It's important to note that AFUE is an efficiency rating that only applies to the furnaces heating ability. Since the AFUE energy efficiency rating only concerns itself with the portion of energy (fuel) the furnace uses when converting energy into heat, and ignores all other costs associated with electrical loads from furnace components such as: Blower Motors, Controls, or any of the other Electrical Components that aren't specifically being utilized to generate heat from a fuel source, it's also important to remember that AFUE only makes up a percentage of what it actually costs to run a furnace, as it's specifically focused on the furnace's fuel efficiency in heating mode. Therefore, AFUE is a seasonal efficiency rating - It only applies to when you heat your home, which is typically in the winter months. 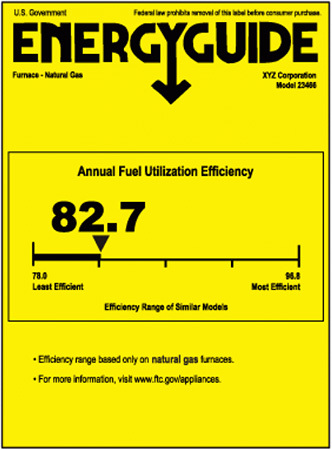 Like vehicles, furnaces can run on a variety of fuels, and like how vehicles share the same Miles Per Gallon label regardless of what type of fuel they use, furnaces also share the same AFUE label regardless of what type of fuel they use, it just changes depending on which type of fuel is used by the furnace. This means it's very important to know what type of fuel your furnace uses as you consider it's fuel efficiency rating, because all fuels vary in price. Because forced air furnaces can use a variety of fuels in order to create heat, such as: Natural Gas, Propane, Electricity, Wood, and Oil, the AFUE rating simply describes how much of that fuel's heat actually enters your home - The higher the AFUE rating, the better the furnace is at converting the fuel it uses into heat that actually makes it into your home, as different fuels can be used to achieve higher or lower AFUE ratings. A furnace with an 80% AFUE rating means only 80% of the heat generated by the furnace is being delivered into the home, and the other 20% is not being delivered into the home. So in the case of an 80% AFUE furnace, for every dollar spent on fuel used to generate heat, only $0.80 cents worth of that fuel actually gets converted to heat that enters the home, the other $0.20 cents worth of fuel never makes it into the home in the form of heat. "Wait just a minute.. What do you mean only a portion of the heat makes it into my home? So the gas furnace in my house is not blowing all the heat it creates into my home?? Where is it blowing the portion that doesn't enter my home?? That's like throwing money away isn't it?" Correct. If you have a gas furnace, wood burning furnace, or any furnace that burns anything period in order to create heat, it creates toxic fumes which have to be vented outside of your home, otherwise your home would be filled with dangerous and harmful gases. Just like your car has an exhaust system that vents the engine's toxic exhaust fumes that come from burning gasoline, furnaces that combust fuels in order to create heat also have an exhaust system, and unfortunately this means a portion of the heat they create is lost through this exhaust system as the toxic fumes are vented out of your home for safety reasons. It's all about the price of fuel. AFUE is important, but it's important to note that if the price of heating your home is specifically what your concerned with, then the type of fuel the furnace uses plays a much more important role when it comes to actual expenses than the actual AFUE rating, as prices vary from fuel type to fuel type. As a rule of thumb, electric furnaces, and propane furnaces both have the highest fuel cost - If you have an electric furnace and you use it to heat your home, it's like operating multiple air conditioners at once, it literally consumes that much energy, which makes it's AFUE rating fairly important. The same goes with propane - With the price of propane and electricity as high as it is, you may want to consider a higher fuel efficiency, especially if you have really long and cold winters where you find yourself running the furnace for an extended period of time, and therefore using more of an expensive fuel. As mentioned earlier - Different fuels can be used to achieve different AFUE ratings, and at this present time the only fuel type that can achieve a 100% AFUE rating is electricity (This is because electric furnaces don't need an exhaust system). "I see.. So how much would I save exactly if I install one of these furnaces with a high AFUE?" That's a difficult question to answer if we think about it, now isn't it? Isn't that question kind of like asking: "So how much would I save exactly if I bought one of these cars with a high MPG fuel efficiency rating?" - The answer is going to vary from person to person. So, just like your car, which has a miles per gallon fuel efficiency rating, the amount of money you save depends on how many miles you drive, as well as the cost you spent on fuel. The same essentially goes for furnaces and AFUE savings. However, in the case of furnaces, instead of miles driven and cost of fuel, with furnaces it's: Duration of Operation, and Cost of Fuel. As we can see, the percentage of savings can vary greatly as we step up in AFUE value, but we have to remember that it also depends on the total cost of our furnace's fuel bill, which is going to depend on how long we run our furnace, right? Therefore, the rate at which we see these savings varies depending on our location, climate, and in essence the amount of time we operate our furnace to heat our home. In other words: AFUE is a seasonal efficiency rating that only comes into play when you're heating your home - The longer you run your furnace to heat your home, the more savings your going to see out of a furnace with a higher AFUE rating. And, if you never heat your home, then your furnace never uses a fuel to produce heat, and therefore you never see any savings from having a high fuel efficiency rating. This also generally means (with an exception to all-electric furnaces), the higher the AFUE a furnace has, the more it initially costs upfront to purchase, and the more it costs to have it installed as well - Combustion furnaces with a high AFUE efficiency rating often have very complex exhaust systems that have to be installed along with them, which includes running extra vent piping up and through the roof of your home, even if you already have existing vent piping from an older furnace. If the cost of fuel your furnace consumed to heat your home for one month during the winter was $100.00, a 98% AFUE furnace would save you $14.00 that month on your fuel bill vs a 80% AFUE furnace. This is why it's important to examine not only the cost of the type of fuel a furnace uses, but also how long the furnace is ran in order to heat your home, as the savings may not make sense in your situation. "Ahh.. I get it.. So at what point does the cost of installing an expensive furnace with a higher AFUE actually become justifiable?" In cooling dominated markets, such as here in Houston, TX, most likely never - Houston winters are very short, it does not snow, and furnaces are not operated in order to heat homes for extended periods of time (if at all). Most of the time in cooling dominated markets such as Houston's, air conditioning equipment is used to cool a home and a furnace is usually only operating to distribute air through the home's ductwork as the air conditioner runs, therefore AFUE isn't as nearly as important of a factor that it may be to someone who lives a heating dominated market, such as in the northern regions of the United States, where furnaces are operated in order to heat homes for much, much longer. For example: If a Houston homeowner only runs their furnace's heating function for 1 month out of the entire year and only saves $14 a year on fuel costs, it's hard to justify spending the hundreds or thousands of extra dollars to purchase and install any furnace beyond the 80% requirement dictated by law, because the savings would most likely not be achieved in a reasonable time frame, if at all during the life time of the furnace. And, in-fact, it is very rare to see furnaces in Houston that have a high AFUE fuel efficiency rating (Unless the homeowner simply didn't understand what AFUE was when they purchased the furnace) and people generally stick with the minimum AFUE rating required by law, simply because a Houston homeowner would never see the savings achieved from a furnace with a high AFUE ever surpass the cost of purchasing and installing the equipment. In heating dominated climates, such as the northern region of the United States, the exact opposite is true - AFUE is much more important as well as fuel type, simply because the furnaces in this region are used to heat homes much more often than they do in the southern region of the United States. Which means fuel bills are higher, and furnace run times are longer, and therefore savings gained from a furnace with a high AFUE are greater. How often do I run my furnace to heat my home? How long are the winters where I live? What type of fuel does my furnace use to generate heat? How much does my furnace's fuel cost where I live? Do I heat my home enough to see justifiable savings gained from purchasing a higher AFUE furnace? Will the savings I see from a higher AFUE ever pay off the cost of the furnace?